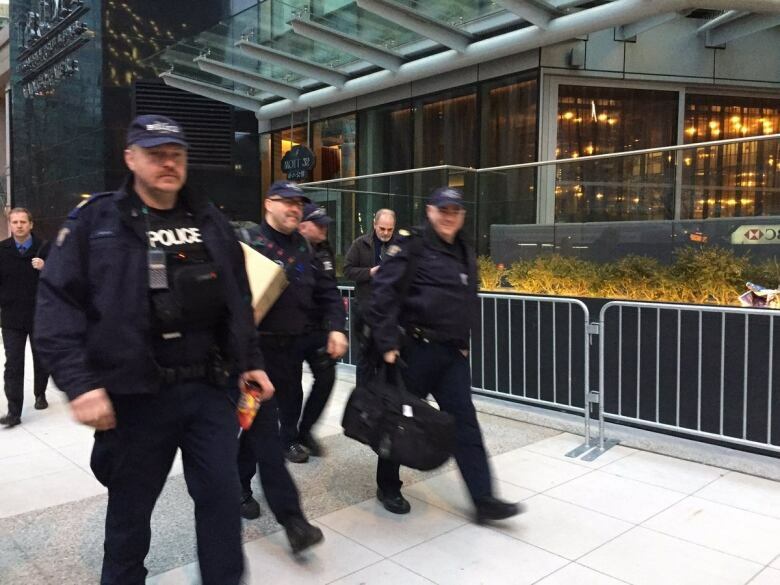 Over 100 people protested the opening of the Trump Tower on West Georgia Street in Vancouver Tuesday morning. 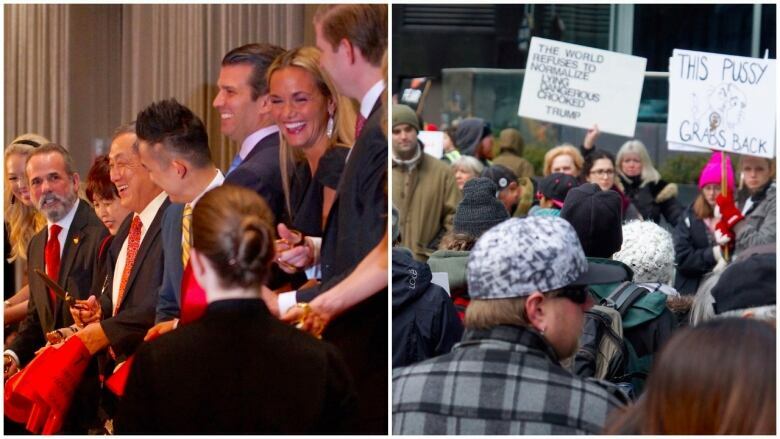 Over 100 people gathered outside the Trump Tower on West Georgia Street in Vancouver this morning to protest the grand opening of the luxury hotel branded with the name of the U.S. president. "I came to show my love and spread kindness and to [ask him] not be a bully to the rest of the world," said protester Henry Ho. "I feel he's lost in hate, lost in ego and lost in insanity," said protester Kelly Shearers. 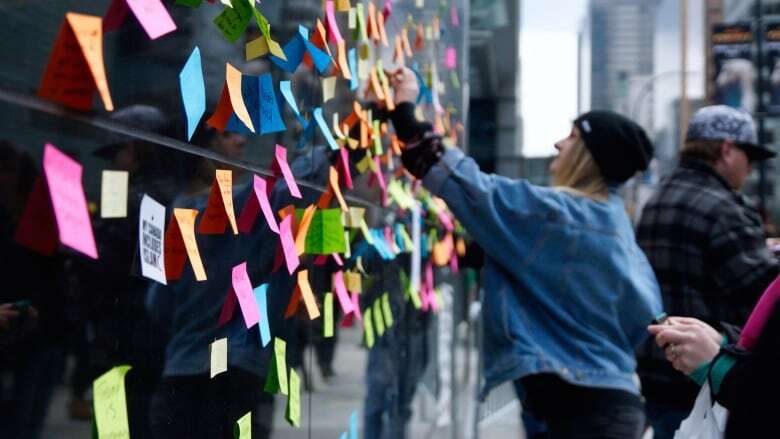 Dozens of sticky notes with messages like "Not Welcome in Vancouver" were stuck to the outside of the hotel. The group outside chanted "We want peace" and sang O Canada while police stood by. Inside, Trump's sons Donald Jr. and Eric spoke and took part in the official ribbon cutting amid heavy security. Donald Jr. told the assembled media, "I'd like to thank the press — just kidding." Eric called Vancouver an "amazing city befitting of the Trump brand." Eric Danziger, CEO of Trump Hotel Collection, mistakenly bragged that the Trump Tower was "the first hotel to open in Vancouver in six years." Hotel Blu on Robson Street opened in 2014. Danziger also erroneously praised Vancouver as the city with world's biggest hockey stick. In fact, the world's biggest hockey stick (and puck) is in Duncan on Vancouver Island. Reporters were not permitted to ask questions at the event. A separate "Resist4peace" rally and march are scheduled to begin at Jack Poole Plaza at 4 p.m. PT.